Radiography is a valuable diagnostic tool. A radiograph (also called an x-ray) is a way to look inside the body and reveal information that may not be discernable from the outside. Radiography can be used to evaluate almost any organ as well as the bones. Radiography is painless, safe, and completely non-invasive. It uses a very low doses of radiation. Because the level of radiation exposure needed to perform radiographs is so low, it is safe for pregnant females and very young pets. 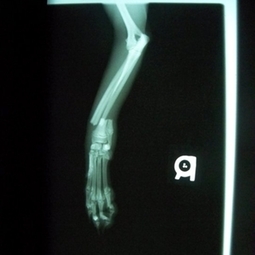 Radiographs can be used to evaluate bones as well as the size, shape, and position of many of the body's organs. Radiography can also be used to diagnose bladder stones, broken bones, chronic arthritis, certain spinal cord diseases, and a variety of other conditions.